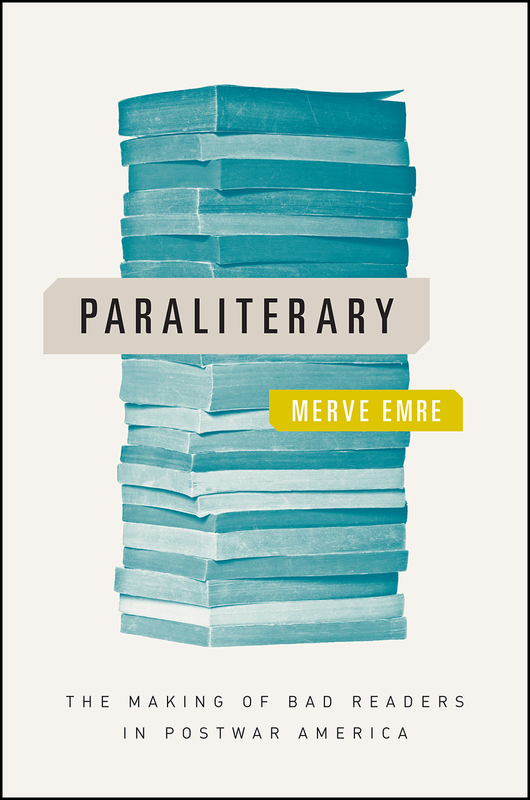 Dr. Merve Emre, an assistant professor in the Department of English at McGill University, recently published her book Paraliterary: The Making of Bad Readers in Postwar America (University of Chicago Press, November 2017). Literature departments are staffed by, and tend to be focused on turning out, "good" readers—attentive to nuance, aware of history, interested in literary texts as self-contained works. But the vast majority of readers are, to use Merve Emre's tongue-in-cheek term, "bad" readers. They read fiction and poetry to be moved, distracted, instructed, improved, engaged as citizens. How should we think about those readers, and what should we make of the structures, well outside the academy, that generate them? We should, Emre argues, think of such readers not as non-literary but as paraliterary—thriving outside the institutions we take as central to the literary world. She traces this phenomenon to the postwar period, when literature played a key role in the rise of American power. At the same time as American universities were producing good readers by the hundreds, many more thousands of bad readers were learning elsewhere to be disciplined public communicators, whether in diplomatic and ambassadorial missions, private and public cultural exchange programs, multinational corporations, or global activist groups. As we grapple with literature's diminished role in the public sphere, Paraliterary suggests a new way to think about literature, its audience, and its potential, one that looks at the civic institutions that have long engaged readers ignored by the academy. For although I am confident I am a bad reader, I am very excited to read this book which was recently sent to me, in a fit of outrageous kindness, by Amanda Golden. Sylvia Plath is a focus of chapter two ("Reading as Feeling"), and as such it is right in my wheelhouse. Paraliterary is $85 (cloth), $27.50 (paperback and e-book) and can be purchased from the University of Chicago Press's website linked above (preferred), as well as from bookstores, physical and online. All links accessed 20 November 2017. 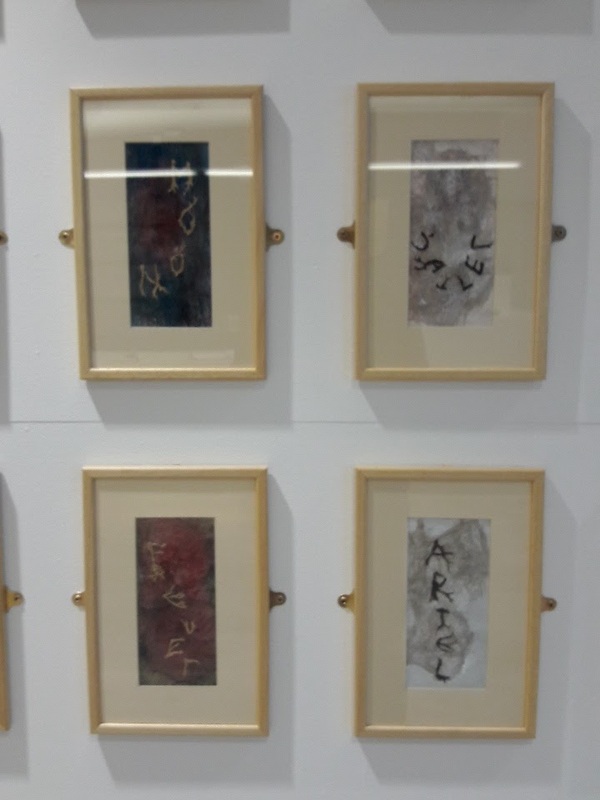 In each of the four Sylvia Plath conferences, art has been a major component of the events. Art, as in art inspired by Sylvia Plath. Several musical compositions have been featured as well. 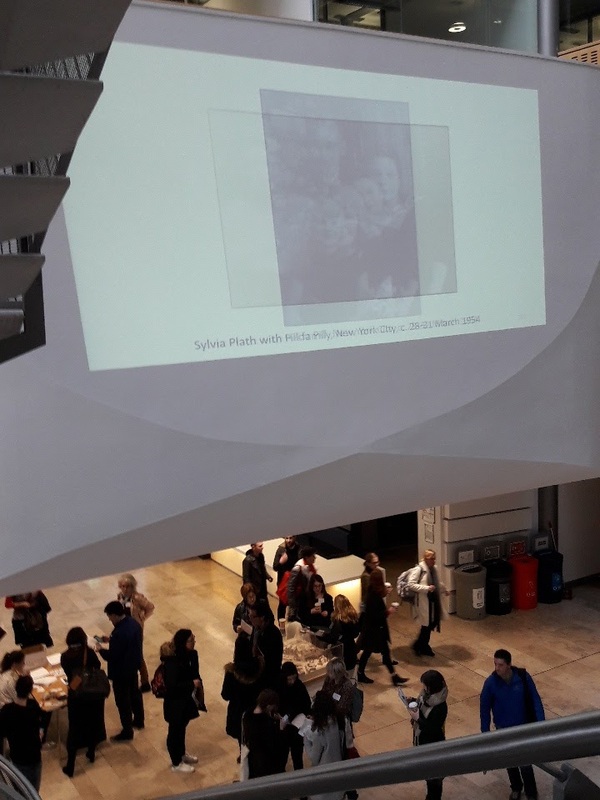 The Sylvia Plath Conference in Belfast, from 10-11 November, continued this tradition. Bella Biddle wowed us with her a choral composition of "Nick and the Candlestick" which I mentioned in my day one review of the conference. 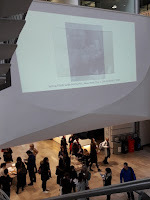 But unintentionally omitted from the previous recap-posts were a more detailed exploration of Christine Walde's exhibit, and, as well, artwork sent to the conference from Macedonia by Kristina Zimbakova. 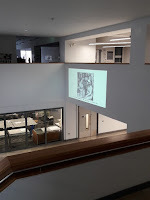 One the first day, in the first panel, speaker Christine Walde spoke on "<maniacs.>: Exploring marginalia and materiality in library copies of Sylvia Plath's catalogue" which was a fascinating discussion on how we are readers interact with Plath's texts. For many years, I have been fascinated by the vivid and abundant marginalia found in library copies of Sylvia Plath's poetry: page after page marked with lines, dashes, arrows and brackets; scribbled with pen, ink and pencil in all colors; awash with correction fluid, coffee rings, blood and tears; their pages torn and cut out, excised from their spines like sore teeth pulled from a throbbing jaw; ebullient, angry, and impassioned comments pleading from the margins, crying out for understanding, justice, salvation, or hope, crowding the white space on the page. 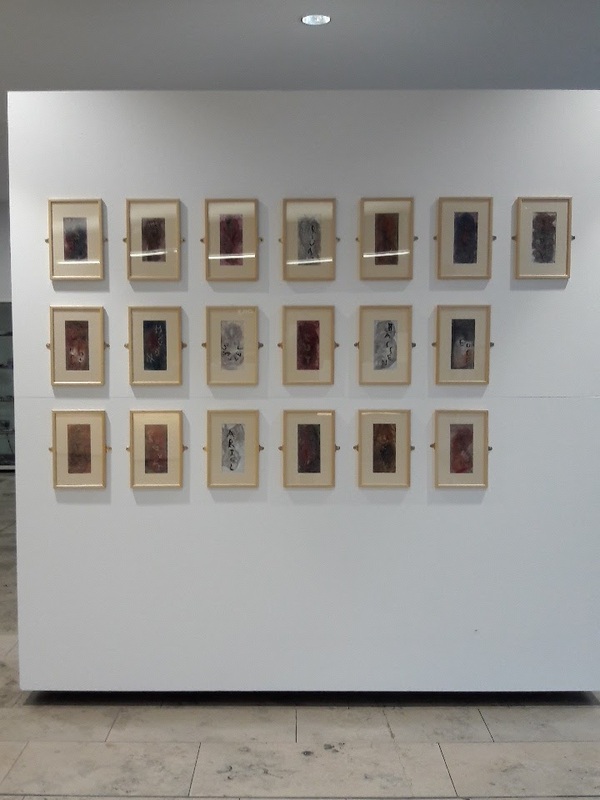 As part of her talk, Christine hung an exhibit of full color reproductions of selections from her research which offers an interesting look at how these anonymous souls responded to Plath. Christine also produced a book of these called <maniacs.> Limited to 20 numbered copies, <maniacs.> is a gorgeously produced volume and reminds me that I need to mark up my own reading copies of Plath! Or, at the least, scan some of the annotations I have made in case she would find it useful. 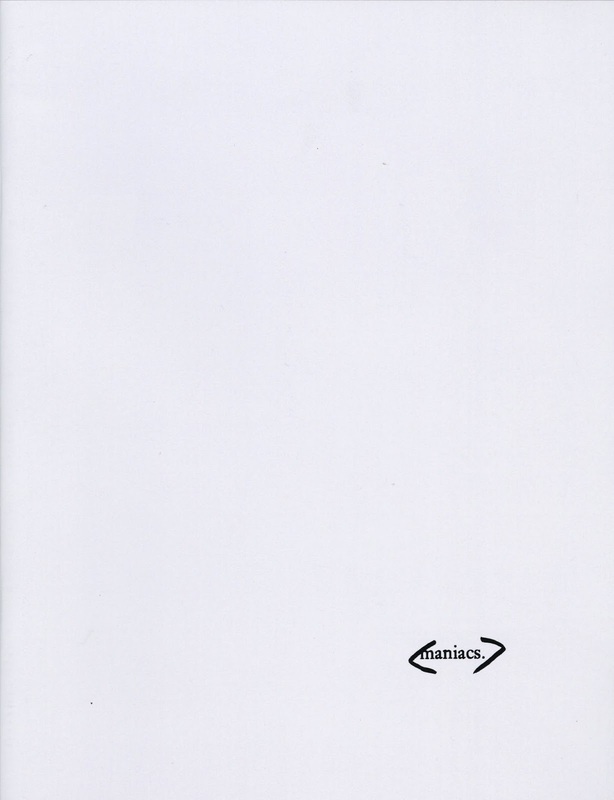 If you are interested, a small number of copies of <maniacs.> is still available, please contact Christine (derwalde@gmail.com) if you are interested in acquiring one. Also, if you have annotated poems by Plath in your own books, she may well want to see those as well. Kristina Zimbakova was unable to attend, in person, the conference but her artwork was on full display on the Saturday, the second day of the conference. 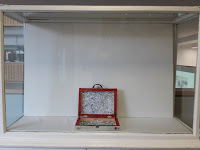 Her creation, 'Poems, Suitcases' was something else altogether to see in person as I have known about it for several years. And it was so appropriate too since we had all traveled there with our own suitcases, with Plath's poems (and letters) in tow. 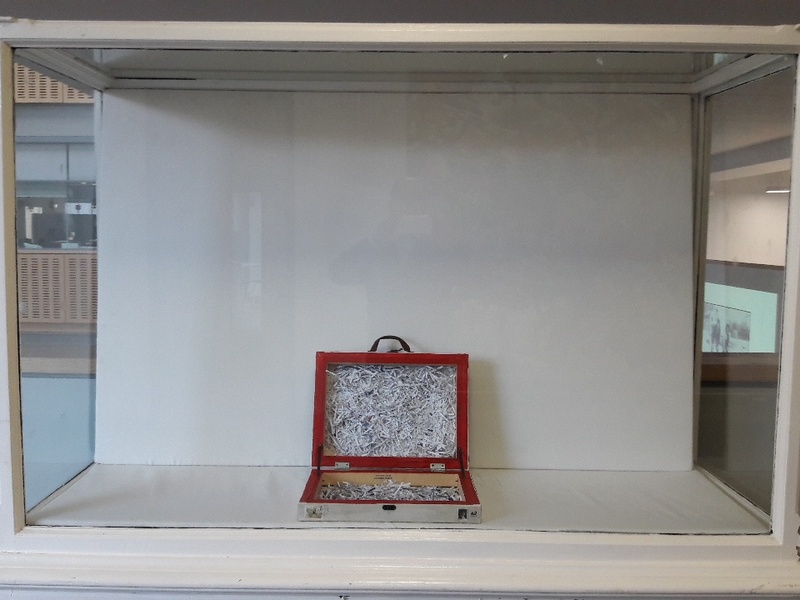 The art installation 'Poems, Suitcases' is inspired by Plath's poetry, and in particular her essay 'A Comparison'. 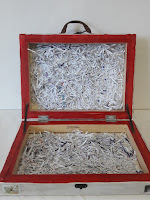 It consists of a sculptural painting (suitcase) and 19 mixed-media drawings. 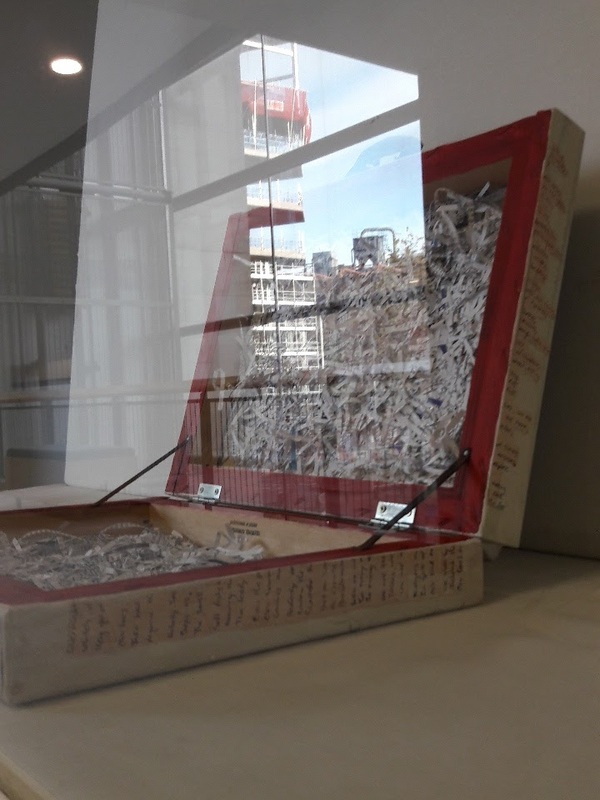 Each piece includes inscriptions of signature Plath poems' titles or central notions in her poetry, and the order arrangement of the pieces creates a story. 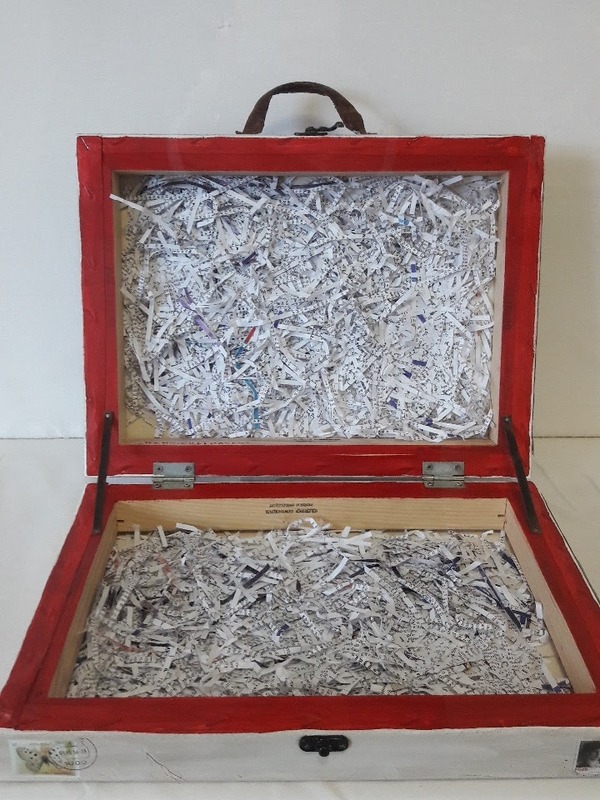 In line with the poem 'Mushrooms' written on the suitcase, the wording is made of lichens, which are a symbiotic association between two fungal species and an alga or cyanobacterium. The closing lines of this poem, 'We shall by morning / Inherit the earth./ Our foot's in the door.' 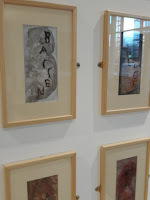 encompass the message of the current installation: the enthralling power of poetry via fungi as symbols of poems. 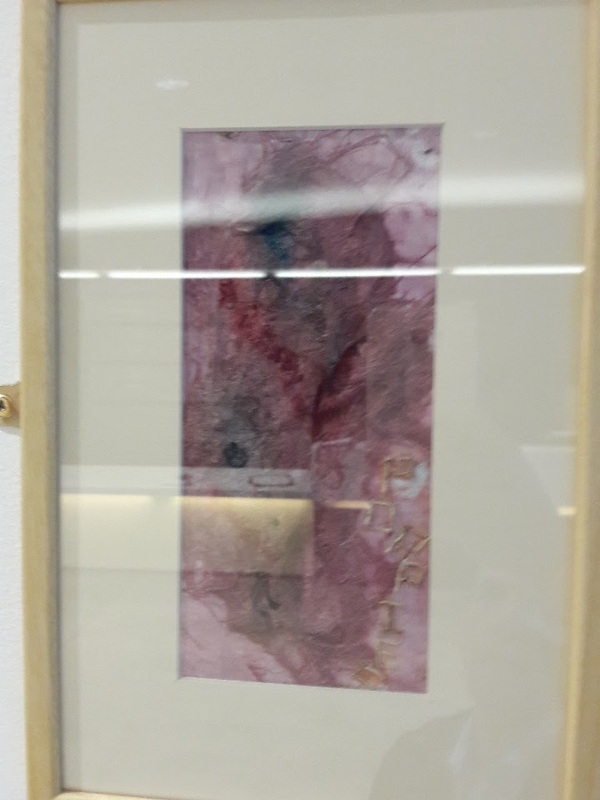 Part of the reason I was so excited to see this is that after the last Plath conference, in 2012 at Indiana University, I sent Kristina some posters from the event as her artwork was featured. On the poster tube, I hand-wrote the poem "Mushrooms" as I knew it to be a favorite of hers, not just as a poem but as a medium with which to work. Little did I know it would be re-purposed into her art. To see it was other-worldly as it was done almost with a sense of the ephemeral. I still have not come down from the high that this conference was and am sure many of you feel much the same. All links accessed: 21 November 2017. PS: I suppose I should make mention the slideshow that ran on Saturday in the foyer of the Ulster University building. The original idea behind this was actually to be in a panel on archives to show some photographs of Plath and discuss with the audience. The panel was not needed which was fine but it actually developed into this idea for a slideshow. I cannot thank enough both Maeve O'Brien and Jonathan Stephenson for their help in bringing this together. 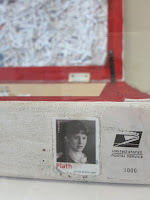 When I started assembling photographs of Plath---from my own files, from books, and as contributions of friends---I thought I might gather 100 as it did not see like there were than many. What became "Sylvia Plath's Life in Photographs" ended up having 305 slides of photographs, with some slides having two or more for comparison purposes. In the end, 325 photographs were found and I am confident there are many "we" do not have access to and thus have not yet seen. Each slide displayed for 5 seconds and the entire thing lasted just over 30 minutes. It was on a loop so it would just start over. I do not know if anyone observed the entire thing or what people thought of it, but it was there! I am so stupidly happy. After leaving Belfast, after such wonderful days at the Conference, after too many night of getting too little sleep, after meeting so many wonderful people and after having so many wonderful conversations, I had a long, six-hour layover in Heathrow airport before my connecting flight from Belfast to Boston. The idea of spending just about as much time in the airport as I would in the plane was unpalatable; so I decided it was worth the effort to zip into London for at least two hours; to make my way of course to Primrose Hill; to walk around and be beaten by wind, rain, air, sun: whatever the elements were offering that unknown day in the future when plans were made. After learning that someone whom I have wanted to meet for years was unable to make the Sylvia Plath Conference in Belfast, Nick Smart and I coordinated to meet for a little walk about and lunch. Nick was at the Plymouth Uni talk back in March 2013 that Gail Crowther and I gave but had to bolt immediately after as he had traveled a long way to attend and have a long evening's, a long night's drive back home. To my delight Nick brought his wife (and most definitely his better half, sorry, Nick), Kathrine, and we three met at 3 Chalcot Square. A more perfect postscript to Maeve O'Brien's conference could not have been planned. 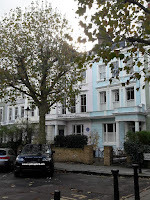 Plath's plaque is still very English Heritage blue; but the house is now pink. Previously yellow, lavendar (sic., to spell it like Plath did), and ages ago white, this soft color is the most, perhaps, befitting Plath's memory in the memory of the house. 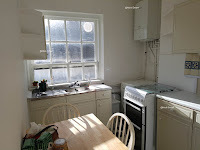 Having been previously in the flat I pointed out the bedroom window as well as the two living room windows. 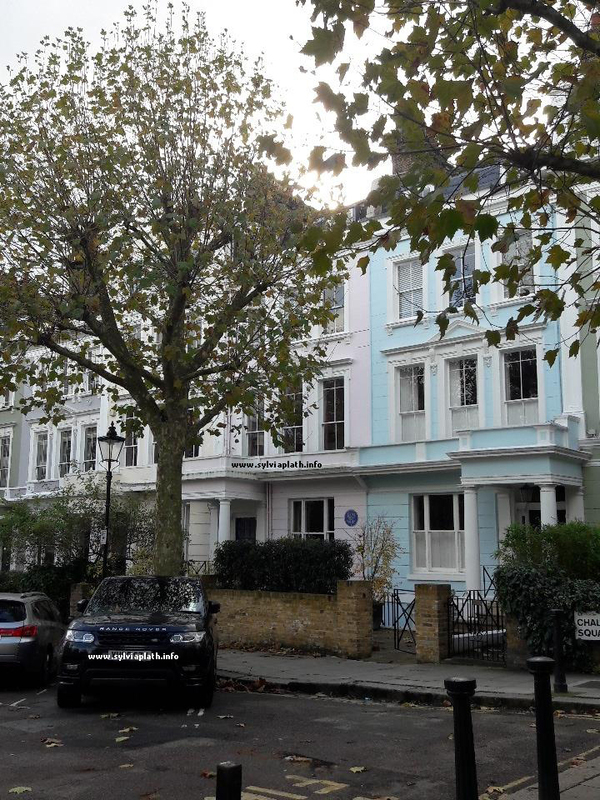 We walked the very short walk to 23 Fitzroy Road; now free of the scaffolding that enfolded it on my last couple of visits. The brick work is clearly clean; and the mid-autumn weather and sun could haven't been better than it was on this Remembrance Sunday to remember Sylvia Plath. The golden hue of the trees at Primrose Hill in at the end of the street were like a shock of daffodils, in a way. We lunched at the Princess of Wales on the northeastern corner of the intersection of Chalcot Road and Fitzroy Road. A superb meal with excellent gossip and conversation about the conference --- oh! wouldn't you like to know! (like Plath's "Mirror"; I was "not cruel, only truthful")--- (As an aside, the Camden Pale Ale is brilliant). 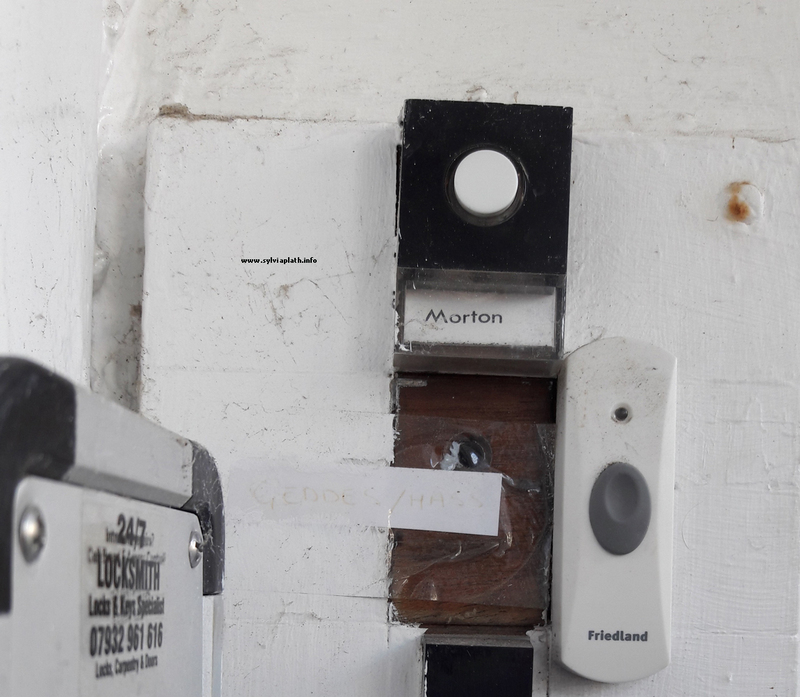 It was then the front door opened and the owner of the house appeared before us. Dr. Glover was as I remembered him from my first two meetings: jovial, friendly, welcoming. 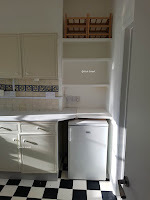 As it turned out, the flat on the second floor (third, American) was vacant and he invited us actually to tour the flat! He disappeared to find the keys and left us on our own. This feels like one of those strange Plath convergence-coincidences that I suspect we have all encountered at one time or another? 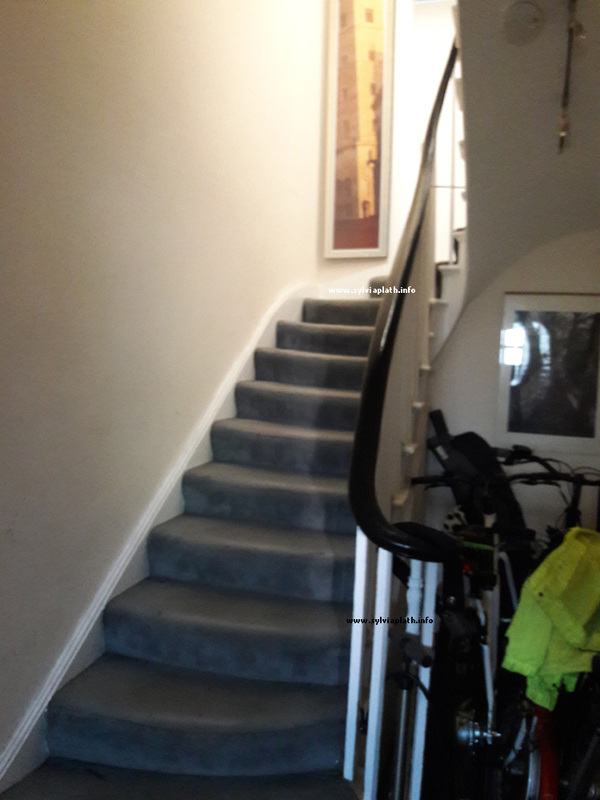 And so, like the panther of "Pursuit", we three started "Coming up and up the stairs." 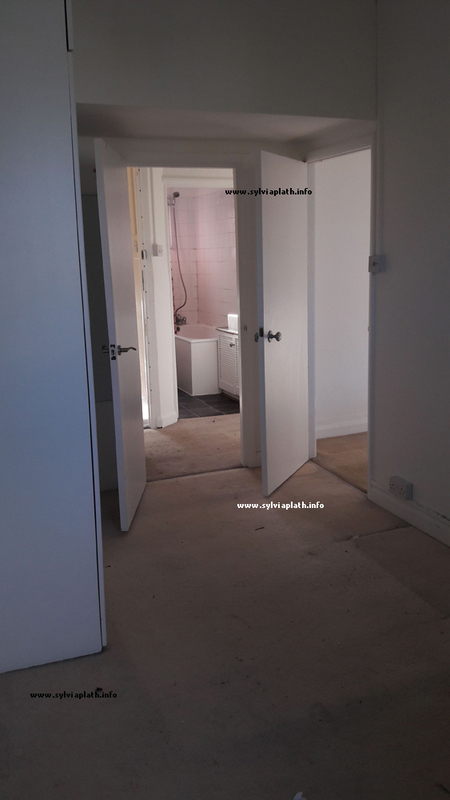 We unlocked the door and were faced with a nearly empty flat; barren of evidence of the lives I last encountered. It looked, as such, both bigger and smaller. We toured each room, looking at walls, ceilings, floors, windows, the pink flamingo shower curtain. The dust show where the tenants never cleaned; the floorboards creaked, the sun dazzled in the south facing kitchen windows and the Square burst with color of trees and grass and the painted faces of houses. 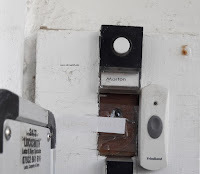 It was a most unreal, but a very real experience to be back in these rooms in a situation that could never, ever, have been imagined after the last memorable time. 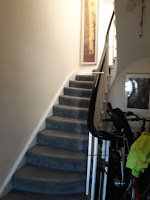 Dr. Glover came to check on us as only was right to do as we had been in the flat, flabberghasted with confused surreal delight, for 15 or so minutes. In the back of my mind was "I have to get back to Heathrow", but it was the last thing I could for myself to do, to willingly leave this space. 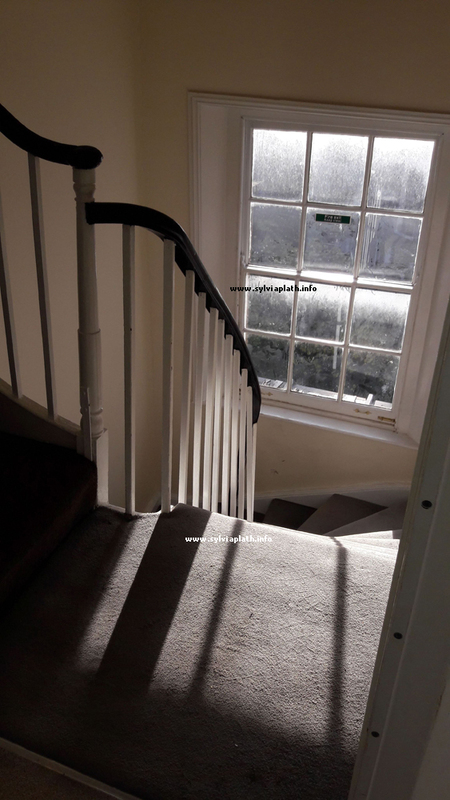 He told us a few anecdotes and then we descended the carpeted stairs, in shock, in awe, in the aura of Plath. 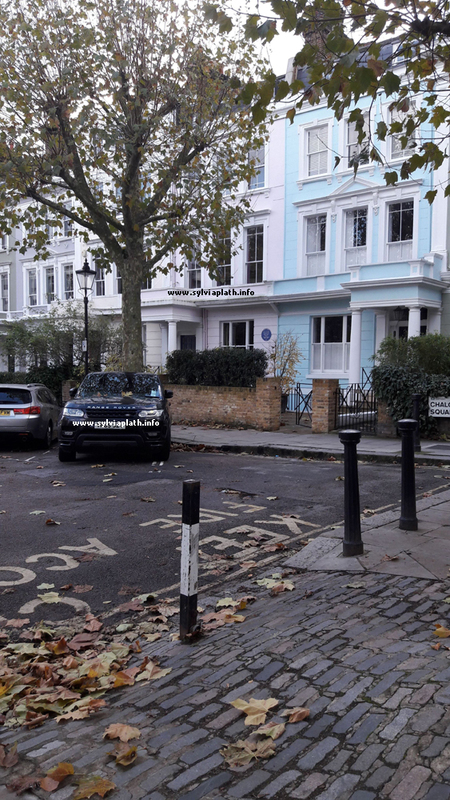 I was kindly driven to Paddington (after too kindly being treated to lunch) where we said our too-soon goodbyes. 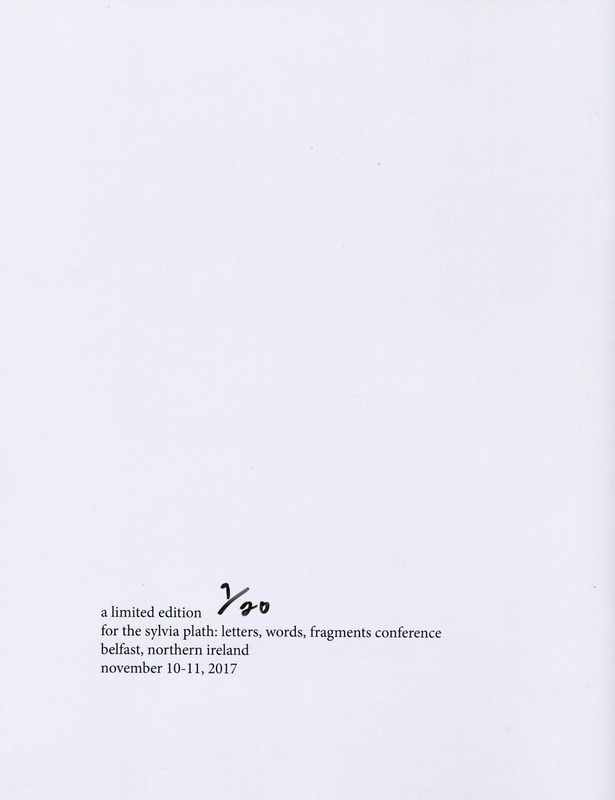 But it was perhaps the best possible, most purely lucky postscript one might get to what was a impossible to believe dream of a conference in Belfast. Work, the next day, within twelve hours of touching down at Boston Logan, was an insult. All links accessed: 14 November 2017. There are two many things that Bella Biddle is to try to define her. Meeting her at the Sylvia Plath conference in Belfast, hearing her paper, and a choral composition of "Nick and the Candlestick" was a definite highlight. For the 11:30 panel, I opted for Panel A: 'Now there are these veils' which saw Cathleen Allyn Conway, Georg Nöffke and Dr Gary Leising discussing theoretical interpretations of Plath's poetry. Cathleen discussed the vampiric identity Plath builds for herself in poems such as 'Lady Lazarus', comparing them to vampires from Bram Stoker's Lucy to Drusilla from Buffy the Vampire Slayer. She discussed the issues of consent and empowerment vampirism provokes in literature, and described how she uses found phrases from Sylvia Plath's canon to create her own "franken-poems", which were both moving and enlightening. Georg Nöffke's paper - "Dying As an Art: Performing Suffering, Suffering the Performance of Death in Sylvia Plath's 'Lazy Lazarus'" gave us an insightful overview as to how Plath's death might be interpreted as her rejection of a patriarchal society. Dr Gary Leising finished the panel with great flair, exploring Plath's use of synedoche, and the way that Plath breaks down her body in poems such as 'Daddy', and prompting some great discussions in the subsequent panel as to how Plath might have used her own poems as synedoche within her collections. At 14:45, I attended the panel; "Personal Reflections: A Safe Space to talk about what Sylvia Plath means to us as fans and readers" which was nothing if not intensely moving for all of us. Alexandra Davis spoke beautifully on her experience as both a student and a teacher, and how the ways we teach Plath can impact children both for better and worse. Lisa Wagoner read a personal essay, documenting the emotional and academic impacts Plath's poetry had on her as a person, and showed us her "I am I am I am" tattoo - which Anna Dykta recognised from her blog! Finally, Jennifer L. Reiger read an excerpt from her essay "You Mean Ted Hughes' Wife?" which had the entire room misty eyed. The subsequent discussion was rich and personal, as the audience attempted to tackle the ways we feel about Plath emotionally. From the way that we all feel so personally linked to her, and yet are aware that love for Plath is so common as can fill a conference, to the way that we fetishise and/or elevate her work, her life, her death, it was the most sensitive and raw talk of the conference so far. Thank you so much, Bella! If anyone else wants to contribute their own commentaries, thoughts, reviews, of any aspect of the Conference please just get in touch! All links accessed 13 November 2017. What is better than the first day of a Sylvia Plath Conference? Maybe the second day. However this time the second day was also the last day and as such this is both joyful and tearful. In theory with a later start to the day many could have slept in. I know for me this was not the case; and I know for some they stayed up late making revisions to their still-to-be-given papers. I was going to again rehearse my own, but decided against it. Day One was so spectacular in large part because all the panels ran in succession, or, because there was nothing concurrent from which to make choices. Day two featured those choices that had to be made and so I have only my own perspectives from the panels I sat in on to discuss here. If anyone out there wants to write a summary of the panels that heard -- even if it is one I mention here -- please sent me some text. The first panel of the day I heard as Panel A "Sylvia Plath and..." which is a great title. 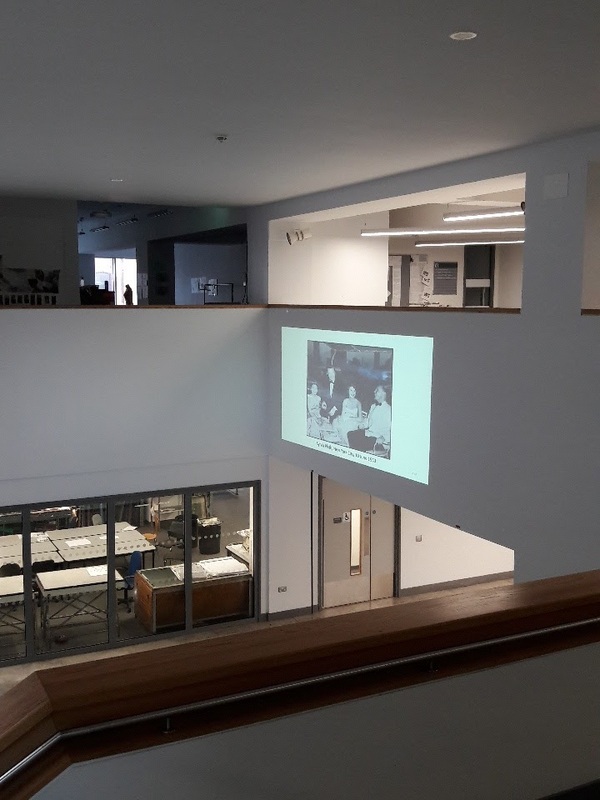 Chaired by Emily Van Duyne, the presenters were Sarah Fletcher (Influence of Anne Sexton on Plath, formally), Di Beddow (Plath and Cambridge), and Mélody Sánchez Camacho (Plath and Atwood). Each of these presenters enraptured us with their work on Plath and [a variety of topics]. I particularly enjoyed learning new connections between Plath and Sexton and Plath and Atwood (neither of whom I've read much). Sarah Fletcher illustrated the really unfair way that Plath has been lauded but Sexton ignored or shunned in large part to their educational backgrounds but yet that Sexton was in some ways ahead of Plath and was able to teach her. Di's project on Plath and Cambridge is up my alley and she seeks to charts the relationship between Ted Hughes and Sylvia Plath at the beginning; a sort of reparation. 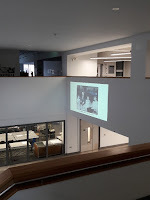 The subject of Mélody's talk, a comparative study of "corpse" poems, might be a bit morbid, perhaps, but I was enthralled to see her findings and connections between Plath and Atwood in their poems. Thank you all for sharing your time and work with us. 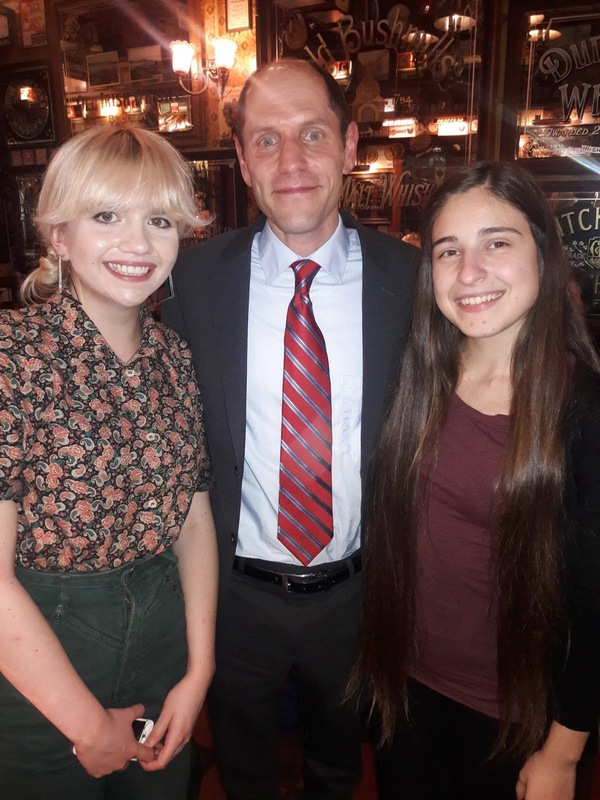 There is much great work being done on Sylvia Plath at the moment and these bright young scholars will keep Plath studies interesting, relevant and progressing. The second and panels may have been the toughest as there were three from which to choose. I opted for Panel B here because Indiana University-Purdue University Columbus seemed to blitzkrieg Belfast with three of the four panelists from that school. The fourth presenter was from Ball State, in it was essentially an Indianapalooza. Dr Julie Goodspeed-Chadwick, Bailey Burnett, Brandi Rund, and Courtney Watkins spoke on "Teaching and Learning in Sylvia Plath Studies and Women's Studies: Community Engagement, Digital Humanities, and Service Learning". This was chaired by Amanda Golden who has long been interested in and held, I think, a leadership role in Plath and pedagogy. Seeing the work that students and doing with research and how this is being expressed through exhibits and other events in community engagement and service learning is inspiring. Educators must nurture this; this is vital work. Lunch was a mob-scene of food and talk and book sales and signing so I came in late, wiping my lips, to the third section this day I decided to sit in on Panel A "Plath as Cultural Currency: Advertising, Clothing and Film" chaired by Danielle K. Nelson and featuring talks by Dr Jonathan Ellis (Plath as punchline), Nicola Presley (Plath, television, and TV advertising), and Rebecca C. Tuite (Plath, self-identity and sleepwear). I was torn as I love The Bell Jar and wanted to see that too; but these papers in Panel A were I think less familiar to me. I loved loved loved each of these talks. Ellis took on those who, I think, were critics of Plath and dismissive of aspects of her production. I missed the first part of it so that's what I'm fuzzy here. It's certainly my loss. Nic Presley's energy and enthusiasm on Plath and television was delightful and her talk looked at "The Wishing Box" and "Child", but showed bits from Plath's journals and The Bell Jar, too. Rebecca C. Tuite show Plath's and her sleepwear as a student, mother, and writer. Illustrated with tons of examples from magazines about the things which Plath was reading and seeing and quite likely also wearing. Thoroughly impressed with each of these talks; the ranges of subjects on the whole was inspiring. I am sorry to say that I missed the fourth panel as I did in the end decide to get some quiet time to prepare for the keynote talk that I was giving with Karen V. Kukil. So, if anyone would like to send something in about their experiences, impressions, and reactions to these please please please do so. I am certain the readers of this blog would enjoy it. The Conference closed with talks by Karen and me on Plath's Letters. 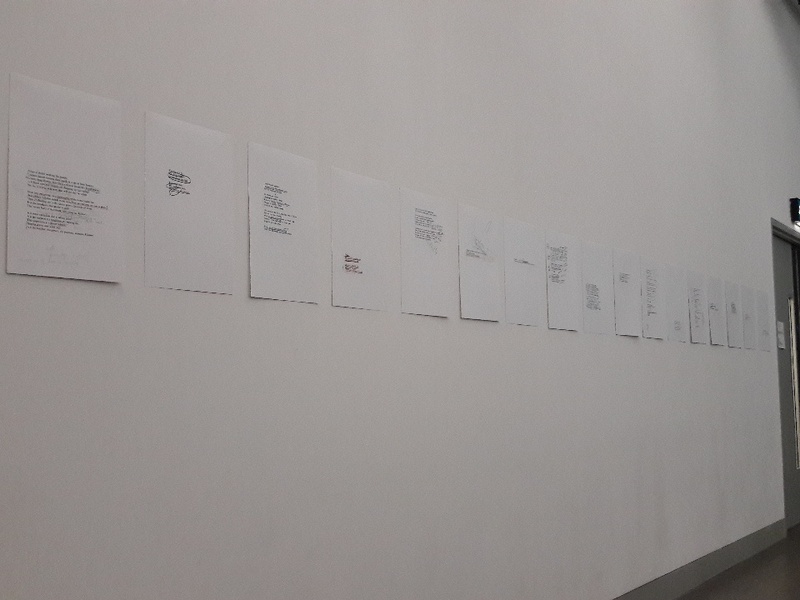 It was particularly thrilling for me to sit in on the papers and hear how so many people had already made use of the letters for their presentations. It also makes me feel that many of them were written really in the last few weeks since the book has not been out for that long! Karen spoke most eloquently on "Beyond Letters Home: Sylvia Plath's Unabridged Correspondence". Karen gave a history of how Letters Home came into being and her own history with regards to editing Plath's Journals and the set up and structure for editing the letters. Karen expertly illustrated Plath's different voices to her correspondents and show that these letters are an art form, pieces carefully and conscientiously constructed with all her thought and energy. My own talk was called "Sylvia Plath's Letters and Traces". 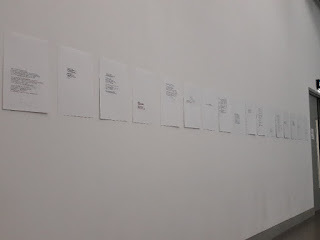 I spoke for about twenty minutes on my role in the editorial process and then spent the last ten minutes showing the work I did on that piece of carbon typing paper I found at the Lilly Library with hidden, lost Plath poems impressed into it. I hope it went over well. Following the talks we had a Q & A with conference organizer and Plath scholar Maeve O'B'rien. And, following that a closing wine reception in the Foyer (though I never made it out there: I'm grateful to Maeve for bringing the wine to me). In the reception and in fact over the course of the conference, I met so many kind people and felt I really got a good handle on names, faces, and projects. It is an exciting time in Sylvia Plath studies and an event like this shows that Plath's works and words do and have and will, as she writes in "Context", traveled "farther than a lifetime." Showing all day in the Foyer was a PowerPoint slideshow that I made showing Plath's life in photographs. When I initially conceived of the idea to do this I thought "Oh, I'll assemble everything and it'll be about 100 images." I was wrong. There are more than 300 of them (and some slides and two to four images!). Jonathan Stephenson suggested five second per photo which meant the loop took about thirty minutes to cycle through. Hope it was enjoyable. After the conference officially concluded many went for pizza and/or drinks nearby. I was able to have a nice quiet dinner with Gail Crowther and catch-up with her. Afterwards we joined many in the loud Duke of York pub for many drinks. I planned to stay until 10, so when I got home at 1 am I was mightily confused at how the time fly by. Chatting all night with Gail, Emily, Georg, Stephanie, Anna, Sarah, Bella, Mélody, Maeve, Gary, Jonathan, Katherine, and anyone I missed out on was outstanding. Lots of laughs, lots of Plath, lots of Guinness and wine and other drinks whose names I know not. Here's a few of us at the end of the night: Bella, me, and Mélody. Hope you don't mind my sharing it! Sorry I look like a dork. Sadly, now, many of us are headed back to our homes after a vibrant few days in the city of Belfast. Maeve O'Brien was a star, the hosting facilities were comfortable, and the city was under chilly and occasional rain but was welcoming. For many of us it was our first time in Belfast and I could not be more impressed with its buildings, culture, pubs, and people. Hope everyone has smooth, safe, and on time travels home. Thank you so much Maeve. Thank you Jonathan! Thank you Eilish. Thank you everyone else whose names I do not know. Thank you Ulster University. Thank you Belfast. And thank you to all the people that registered, presented, and made these last few days memorable. Thank you again, Maeve. Being at a Sylvia Plath Conference often means you end up, quite quickly, in a stupor of over-stimulation from the talks. This conference is, thus, typical. Even the act of collecting my name tag and programme took on a kind of wonder as you meet people that you have emailed with or conversed with over social media. This is what happened when I met Eilish, who was on the desk helping out (and doing a wonderful job of it). Chaired by Jonathan Stephenson, panel two was "Visualising Plath's Poetry: Artistic Critiques and Responses". 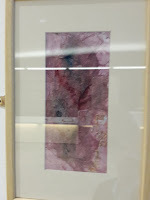 The speakers here, Dr Ikram Hili (Poems as watercolour paintings), Carmen Bonasera (Ariel, chromatic & natural imagery), and Bella Biddle (Plath and art) concentrated convincingly on the use of color in Plath's poems. I really could have listened to each the entire day, only, as I know they each only scratched the surface on these topics. Bella Biddle played a beautiful choral composition of "Nick and the Candlestick" which hauntingly swirls in my head at this very moment. 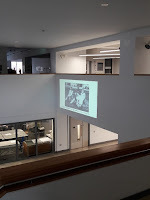 The third panel was chaired by Gail Crowther and had just two exciting speakers: Julia Gordon-Bramer on Plath and Whiteness and Siana Bangura on "Black Women Don't Get to Confess": Sylvia Plath re-read through a Black Feminist framework. These talks were interesting and lead to lunch. After lunch, panel four considered Aurelia Schober Plath. 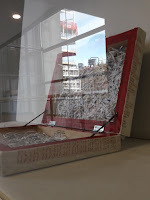 The papers by Dr Adrianne Kalfopoulou (making of the Plathian voice), Catherine Rankovic (Aurelia Plath's Gregg shortland annotations), and Dr Janet Badia (mother-daughter intimacy in the archive) was better and more energizing than coffee. I am fairly certain my jaw hit he floor every few minutes during these presentations. It seems there is a lot of interest in Aurelia Schober Plath and got the impression people are just beginning to scratch the surface of her as a woman, as a wife, and as a mother. Nicola Presley chaired the Ted Hughes panel which you might think was mean. But she was awesome as were the four talks by Dr Carrie Smith (Manuscript drafts of Ted Hughes' Cave Birds), Dr Mark Wormald (Plath, Hughes, Wevill, pikes and shrikes); Terry Gifford (Hughes editing Plath's "Child") and Dr Holly Ranger (Plath in Tales from Ovid). I cannot say anything about these papers other than they blew me away. It was a particular highlight to meet each of the speakers as I knew their names and read their work but never come across them. In the end, initially, the audience was left speechless. I was a bit agitated as during Gifford's talk I recognized that his paper and conclusions were faulty and discussed this with him privately, afterwards, as I could not muster courage or what have you to do so to within earshot of the assembled audience. The sixth and last panel of the day, chaired by organizer Maeve O'Brien was 'Gaslighting' Sylvia Plath: Critical Responses / New Directions and was spirited. The presenters were Peter Fydler (publishing watershed in 1975-1976), Dr Tim Hancock (Another 'Ariel'), Dr Chiara Luis (ripping apart the excessive reaction to Plath by Terry Castle), and Emily Van Duyne (Plath, Hughes and literary abuse). Each convincingly discussed their topics, often with humor, which was much appreciated at the end of the long day. Overall, it was fantastic to meet and see so many people, talk Plath (and Hughes) (and other stuff) and spend good quality time with like minded folks. Dinner, hosted in the Native, was lovely with great food, excellent drinks, and of course over-stimulating conversation (which somehow morphed into a brief discuss of Hobbits procreating... but do not ask me how we got there). So many people were tweeting about the day so make sure to look at #sylviaplath2017 in the Twitter. All links accessed 11 November 2017. 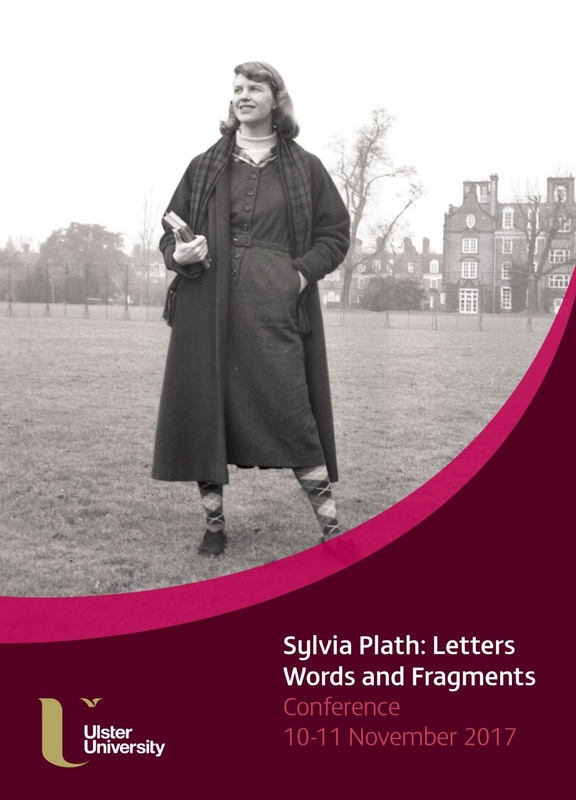 Today begins the Ulster University Conference: Sylvia Plath: Letters Words and Fragments. The conference was organized by Maeve O'Brien and a massive thank you is due to her for that. Last night there was a pre-conference meet-up a the Sunflower on Union Street. Though it was raining there were some 20 or so people there. New faces, familiar faces and lots of camaraderie. Look for conference updates here throughout the two days of the event, I hope. But certainly by next week after everything is said and done and processed. Well, things have been kind of crazy for the last six weeks or so. 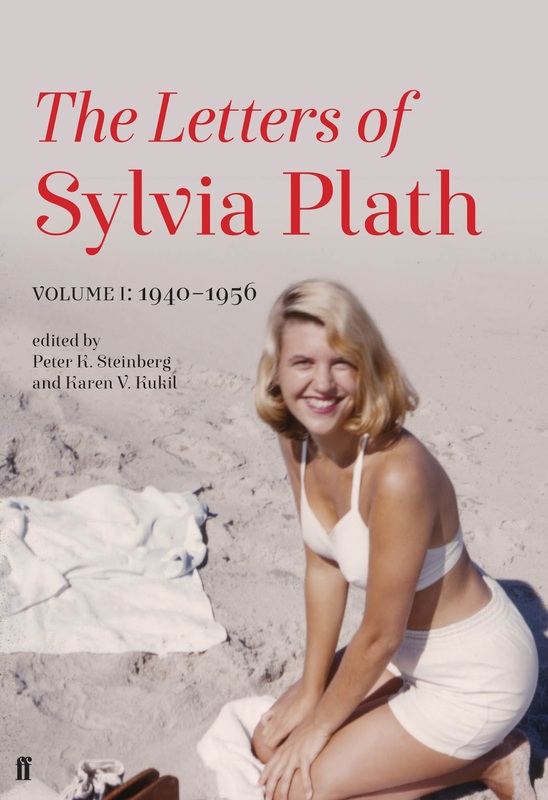 With the publication of The Letters of Sylvia Plath, Volume 1: 1940-1956 in the UK and the US, and then participating in one event, following other events, looking for reviews, etc. it is not hard to imagine why! But I wanted to give a general update at this point in time on a few things. First up, those reviews: I have started to list review of the Letters on my website for Sylvia Plath, A celebration, this is. in the "Reviews of works by Sylvia Plath" page. This will be updated as I learn of reviews. The good people at Faber and HarperCollins have sent several to me which is wonderful. If you know of any not list please do let me know about it. I do not read them all but it will be helpful I think to have them tracked. In August and September I did three posts on "The Education of Sylvia Plath", looking at her courses and writings for each academic year: 1950-1951, 1951-1952, and 1952-1953. I do have two more posts planned so fear not! Those will appear before too long. 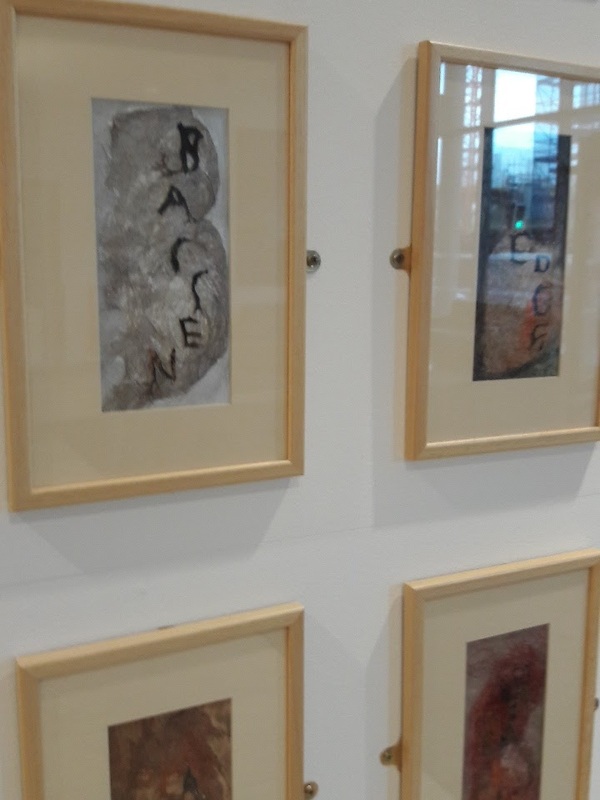 One thing I have not blogged about since 10 April of this year is the Belfast Conference: Sylvia Plath: Letters, Words, Fragments. The programme was recently made available and it looks positively, mind-bogglingly awesome. This is the fourth major international Plath conference following ones held at Indiana University in 2002 and 2012, and one held in Oxford in 2007. Just a few of us will have been to all four of them and what I find most awesome is how each conference produces a new crop of people with unique tastes, interests, and perspectives. Maeve O'Brien deserves major congratulations for organizing the conference. I am leaving tonight for the conference and hope to blog about Belfast and the presentations. If you are attending and want to write up your observations and feeling about anything in a guest post, please do reach out to me there or via email! After The Letters of Sylvia Plath were published I decided to treat myself to a purchase or two. I did not know what I was going to buy, but them stumbled on a publication that I did not previously know about. 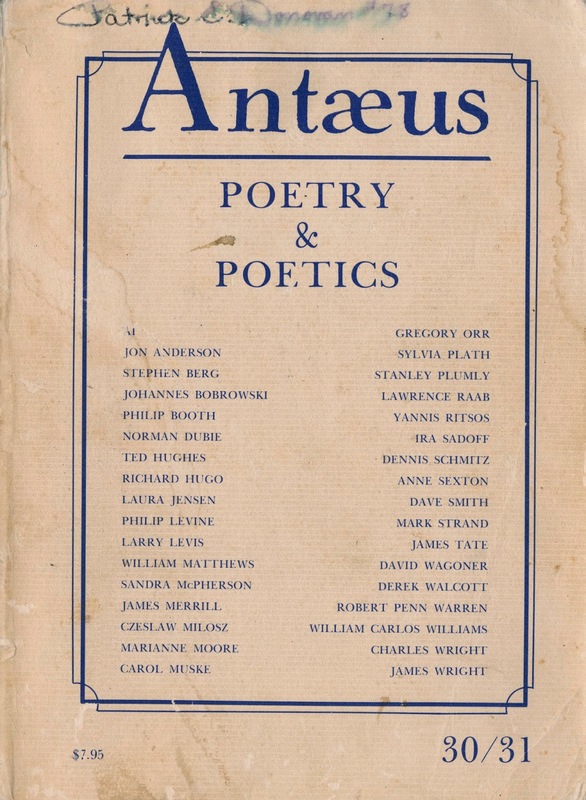 In their Spring 1978 issue, Antaeus published two poems by Plath: "Stings (2)" and "Words heard, by accident, over the phone". 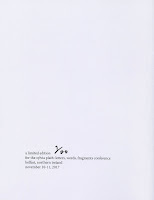 The poems appear on pages 41 and 42 respectively. These are missing from Stephen Tabor's otherwise excellent Annotated Bibliography and were the first periodical publications for each (both did appear in the limited edition Pursuit, published in 1973). The cover and poems are both now on my website. 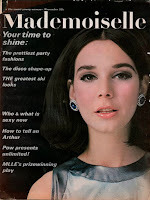 The other purchase I made was the November 1965 issue of Mademoiselle which printed Plath's poem "November Graveyard." A mostly random publication of this poem, for sure. Since I drafted this blog I got another special treat and will blog about that later on in the month. With the end of the year fast approaching it is time to start trying to make sense of Sylvia Plath in 2017. This year has seemed a convoluted whirlwind of activity for me. What about for you? I will try to summarize the year as I have done in the past with a Year in Review piece. Additionally, I look forward to some updates to my website that I hope you will like in early 2018. Speaking of 2018: did you know that my website will be 20 years old in 2018? Twenty! All links accessed 28 October 2017. 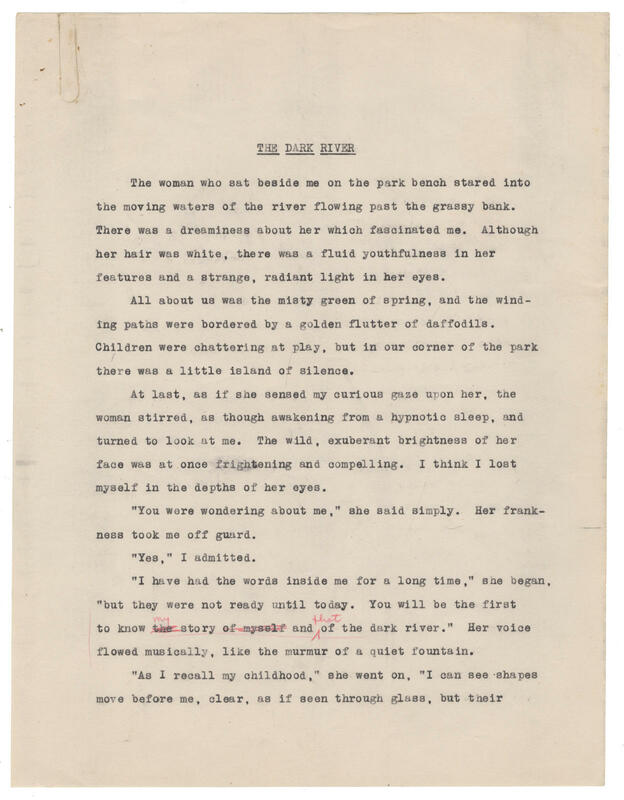 Bonhams, London, is auctioning a seven page typescript copy of Sylvia Plath's 1949 short story "The Dark River" on 15 November 2017. Lot 239 is expected to reach £600-800/US$ 800-1,100. 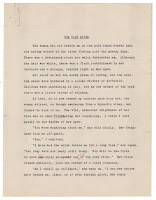 The Lilly Library holds two typescript copies of Plath's "The Dark River". The first copy is the top sheet; the auction copy here being its carbon. The Second copy at Lilly was typed later and reflects the changes suggested by the red pencil annotations on the auction copy. If anyone buys this for me I will be quite grateful. Thanks to Jonathan Bate for informing me about the auction. All links accessed 26 October and 2 November 2017.